The passionate, rich and honest spiritual journey of a woman who left her church after awakening to the Divine Feminine. In her sequel to Faith Evolving, Trish McBride honours the Presence of the Holy One who permeates All that Is, however we may name Her/Him. The book holds a range of writing: poetry, theological reflection, pilgrimage/travel writing, myth and article. Take it as a whole or one piece at a time! The passionate, rich and honest spiritual journey of a woman who left her church after awakening to the Devine Feminine. 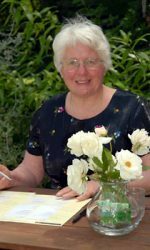 In her sequel to Faith Evolving, Trish McBride honours the presence of the Holy One who permeates All that Is, however we may name Her/Him, in an authentic expression of women’s spirituality. The diversity of prose and poetic pieces of writing is ‘quilted’ together with a clear, consistent voice. It is challenging and provocative in places, but also mellow and joyous, conveying the darkness and the light of the spiritual path. It claims continuity with the essence of the Catholic Christian tradition while exploring far and wide beyond. There is a sharing of the intimate details of a spiritual journey, attention to the texture of place, time and Spirit, an ability to convey the ‘feel’ of experiences and travels, and delight in the company of others on the Way. Trish’s honesty, integrity and ability to reflect on her experiences make this book a great read, either as a whole, or a piece at a time. Readers interested in the contribution to faith of ‘mind’ as well as ‘heart’ will find this a rich resource. All of life is sacred! 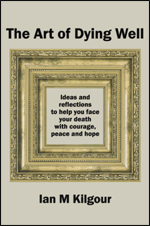 “Trish McBride’s brave and creative book deserves a wide audience. She is a fearless spiritual explorer dedicated to making sense of her own journey and the world around her. With a faith that is genuinely life-giving and liberation-focused, she travels everywhere across the planet, across religious and spiritual traditions, across ethnic and gender divides. ‘Faith seeking understanding’ can and must go in any direction!” Mike Fitzsimons, writer and publisher. I was glad to have this metaphor of patches in front of me because it meant I could more easily navigate the shifts and changes in this offering. This is the second book in which Trish shares pieces of her life story and it is woven together simply. 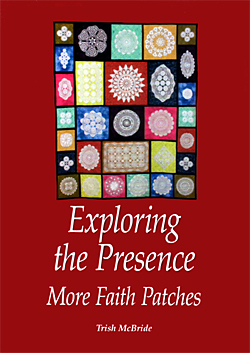 The first was Faith Evolving: A Patchwork Journey (2005). There were times in her story when I wanted to know more. At other times I was reintroduced to old friends both people and ideas. These include the articles from Vashti’s Voices, which was a significant magazine for Christian Feminists. It was a delight to find reminders of the Women’s Conferences and workshops that were so supportive and stimulating to women in their time. Such events fired many of the reforms now taken for granted and are almost in danger of being lost. This is an honest book and on many levels a brave one. It has not been easy for women of faith to live through the changing times of the Church in Aotearoa. Many have stepped beyond the Sunday fabric and institutional bindings but stay anchored to the greater good. Trish chronicles such a journey. This is a book which can be approached in many ways. It is a spiritual journal reminding us that most of us live lives of many paths and that ‘One Way Jesus’ is not a helpful slogan at any level of Christianity. From Catholic child to a woman of universal consciousness Trish writes of the various stages of her faith and of how what is important has been distilled. It is also a book of travel. Scattered through the book are accounts the pilgrimages that have become a strong part of Trish’s spiritual life. There are glimpses of encounters with spirited people, locally and further afield – to Germany to visit Bingen to pay homage to Hildegard, Greece, Australia and more. Sadly there are many who think theology is something studied at a distance from self. This is book of practical and contextual theology, showing that good theology is embedded in our lives. Included here is an essay ‘As we forgive them… or not – When forgiveness is inappropriate’. This was written to be included in the Auckland Catholic Institute of Theology book on sin and wrong doing and relays the experience of traumatised and marginalised people. The question of forgiveness is so important in sound pastoral work and is often one of the most trivialised. Not here, this essay is the pearl of great cost.